The first time I met Jenny Sichel it was hot. Oklahoma hot. You know this kind of hot. It’s the hot that drips from your elbows. It’s the hot that no amount of water or sunscreen can help. It’s the hot that makes everything crystallize–your mind stripping away everything that isn’t essential–as you strive to keep your body temperature below the red line. Somehow, in this type of heat, you become better, more efficient, more direct. And this is what I noticed most as I watched Jenny Sichel cox that first day on the Oklahoma River, the heat as thick as the wind. Sichel is a two-time World Championship silver medalist (2014 and ’15) as the coxswain of the Legs, Trunk and Arms Mixed Para Four (LTAMix4+). She’s compact and has curly hair that she keeps back in a ponytail most of the time. But when I first met her, in the summer of 2010, at a training camp for adaptive athletes seeking to make the national team, her hair was bob-short. Sichel had just graduated from Bryn Mawr College with a degree in mathematics and had been involved in rowing for four years. Sichel started rowing at Bryn Mawr College, a small women’s college in Philadelphia, Pennsylvania. “I like to say I majored in rowing, not math,” she says with a laugh, “but my parents don’t particularly like to hear that.” Even though she was only five feet, two inches tall, she rowed bow seat in the varsity boat her freshman year. During her sophomore year, she was moved to the stroke seat and spent most of that fall facing her coxswain. She was tiny for a rower, but her teammates didn’t care; she had a long stroke and set the pace for Bryn Mawr at the Head of the Charles Regatta that year. A herniated disk in the spring of 2008, however, moved her from the boat to the shore, and she spent many practices painting oars while her teammates went out on the water. Sichel coxed the rest of her college career in the Varsity 8+. “I found I was somewhat natural in that seat. I wondered how good I could be.” And so, after meeting the adaptive national team coach in the summer of 2009, Sichel was invited to a development camp in Oklahoma City. It was there, in the heat of the Oklahoma summer, that Sichel began to cox adaptive boats. After the end of her senior year at Bryn Mawr, her coach, Carol Bower, encouraged her to pursue coxing at the next level. “By that time,” she says, “the sport had gotten me, hook, line and sinker. I loved the dedication it took, the training to race at that next level.” She pauses here, weighing her words, and then begins describing her passion. I ask Sichel if she’s a different coxswain when she’s with adaptive athletes. Her answer surprises me. “In many ways I’m more particular with my commands. You can’t say, ‘One foot in’ to someone with one leg, or ‘Go get that oar’ to blind athletes. I’m a bit more aware of the directions I give to the athletes and how they can be interpreted. “Coxing the para boat has made me a better cox in a shorter period of time. Not only have I learned to be more specific and more articulate, but I have grown in my skills for solving problems. It puts you in situations you’d never expect to be in. You’re forced to work through them.” I think to myself that she’s talking about on-the-water coxing of athletes who are blind or use a prosthetic device on a limb, but I’m wrong. I ask her to fast forward to her last World Championship race, in the fall of 2015, in Aiguebelette, France, where the United States led for the first 500 meters but the British boat sneaked past for gold, crossing the line 0.26 seconds ahead of the United States. “You have to take everything the rowers and coaches tell you during practices and create your own thoughts. 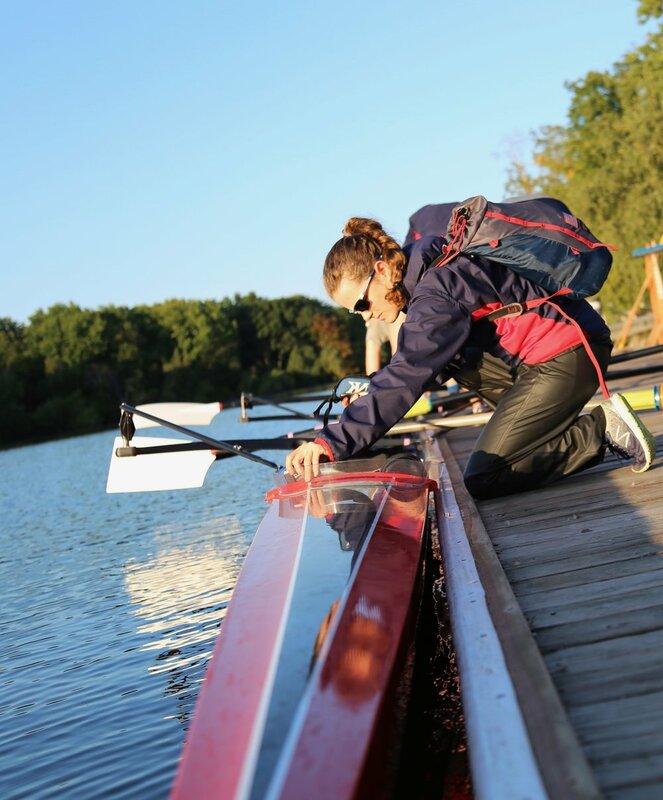 Those critiques after my calls give me the awareness necessary to produce more speed.” She goes on, talking about how she developed as a coxswain. “There was one piece of advice from a rower that changed the way I coxed. One day, a Masters rower said to me, ‘Jenny, you have to talk 80% less than you do.’ That completely changed my coxing. All of a sudden, it clicked. Overnight, it made me comfortable with quiet in the boat.” She lets that settle over us. “80%?” I ask. She smiles and nods, then goes on about other aspects of coxing she’s learned. “As a coxswain, when you first start out, some coaches almost put you on a pedestal in relation to your rowers. But as a coxswain what you need is that athlete-to-athlete relationship.” An excitement in her voice begins to show, and it’s infectious. “In 2012, when I went to Selection Camp, I didn’t know the rowers. I knew how to cox, and I was good at it, but I wasn’t working with them. I was working at them.” I ask her to explain. I ask her if she’s going to stick with coxing the adaptive team in the future. “I’m training now for 2016 Paralympic Selection Camp,” she says. “I really enjoy the challenge of coxing two genders and four different disabilities, while moving at speeds no one has seen before. I definitely want to continue coxing and striving to become better in the coming years.” Again, that infectious energy. “Right now, I try to cox twice a day, although you can only cox when there’s a boat available. But every row–good or bad–helps me be more aware of what’s happening in the boat.” She grows contemplative again. “Coxing is such a public thing. When you’re rowing, in order to get faster, you correct your form. When you’re coxing, you have to correct your thinking, and everyone is listening as you correct yourself. The best thing I can do is to get on the same page with the coach and the rowers. For Sichel, the try-outs for the 2016 Paralympics loom ahead of her, in Boston. “It’s a camp boat, so they invite two or three coxswains. We seat race. We time trial.” Even though she’s an experienced coxswain, she knows there’s nothing to take for granted. “Zero-point-two-six seconds,” she says, remembering the 2015 silver medal finish. You can tell she knows. In the coxswain’s seat, every stroke–and every call–is the difference between second and first. "Coxing the para boat has made me a better cox in a shorter period of time." "You’re not going to tell a math major that the rowing stroke is like a haiku." One of the boat bays at Community Rowing, Inc.